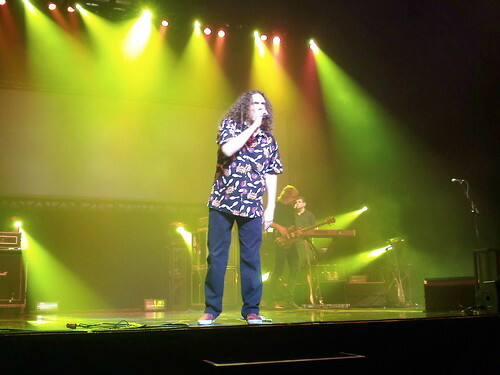 This Saturday morning, Heather and I got up and headed to Vancouver for the Weird Al concert at the Boulevard Casino in BC. The drive up was nice and quick, with a stop at Arby's and only 10-15 minute wait at the border. It was tough to find the hotel, because apparently, Canadians do not believe in road signs. We could never tell which road we were on, which highway we were about to enter, or what the directions we had from google actually corresponded to in real life. We ended up finding our way to the hotel not using our directions, but by a combination of instinct and blind luck. We got to our hotel, and had a nap (we were both tired from John's birthday party the night before) and then got up for the show. Once again, the directions to the casino weren't any help at all. They got us to the right freeway, but once we exited, we had absolutely no idea where we were. The directions called out streets we couldn't find signs for and mentioned places we didn't see. We ended up finding the casino using the black and white map on the Google directions and intuision for directions. That got us to the general area, and then there were a couple of 1 foot tall signs that said "Casino" with an arrow on them. Those helped. The Casino is a lot bigger than I had imagined it would be, and had a more "Vegas" feel to it than some of those tribal and domestic casinos I've seen in the past. It was big, with lots of slot machines, gaming tables and a huge 6 story concrete parking garage. We ate dinner at their little food court, Heather had pasta and I had some sort of shrimp noodle soup. The theater itself is housed in a separate two story building. You enter through a lobby, where there is a bar, the merch booth and two staircases on either side of the lobby. You take the staircases up to the second floor, where there are more bars and two entrances to the theater itself. The seating was ampitheater style, and the front row seats Heather and I had gotten required walking all the way down the stairs to the bottom of the venue. Two in house monitors were on the left and right of the stage, and then the band had the three hanging monitors above them on stage. 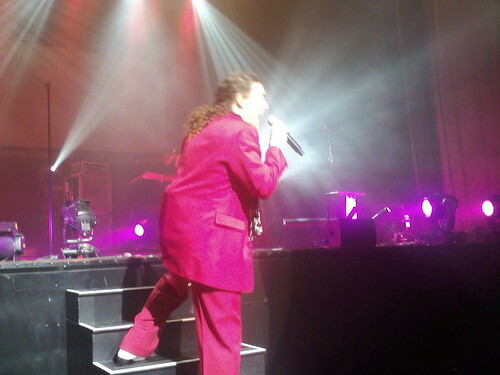 As usual, Al came out into the audience during "Wanna B Ur Lovr"and climbed the stairs towards the top of the theater. They said at the door that cameras were not allowed, but I saw several people using them during the show, I was really bummed that I didn't try to sneak mine in. I did get several pictures with my camera phone. They aren't the best, but I'll share them just the same. This next one was taken right after Al sang the "Bomb" verse to Heather. She was happy, as this was the second time he's come down into the audience and sang to her during a show. People seemed to be really into the TV clips (you could tell lots of folks were seeing them for the first time). They particularly liked the Canadian themed ones (Celine Dion and Avril Lavigne got big laughs and cheers). Halfway through the show, there was one glitch, which actually made things more intersting. During the opening of The Saga Begins, Reuben lost keyboard audio, and Al was singing it acapella. I wondered for a minute if he'd just keep going, but they managed to fix the sound before it was time for the band to come in. No Stormtroopers at this stop, and Yoda had that new part of the chant I don't know how to do yet...but this was still my favorite part of the show up to that point. Fat was a great finale, and afterwards, no one got up to leave. 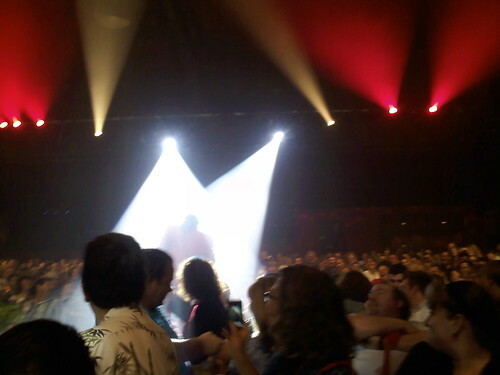 There was a real standing ovation, which was cool because the crowd wasn't as rowdy as other shows I've been to in the past. Cell phones had everyone on their feet, and then it was followed by the best performance of Albuquerque I have ever seen. There was lots of singing along, the part with the donuts was REALLY extended, and he kept asking about "Nanaimo Bars", something I had never heard him do before in concert. 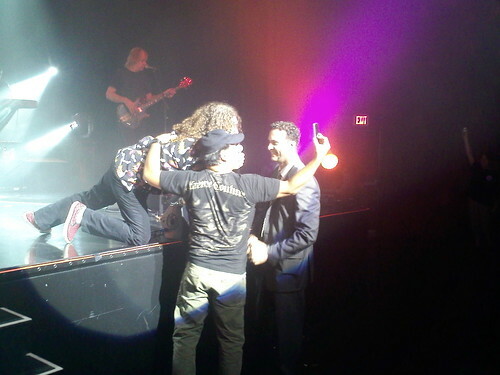 During this song, some fan went right up to the stage to take a picture of Al with his camera phone. Security was on him right away and was about to move him away, but Al grabbed the security guy and sang directly to him while the fan took the picture. It was hilarious and people cheered, but the down side was, Al's kindness inspired a few other morons to try and do the same thing...and they ended up being ejected by security for it. The guy sitting next to me was filming this with his camera, so it'll probably end up on youtube. During the "Lost my train of thought" part of the song, the band ended up starting all over again, which I loved. I'm not sure if this is a part of the tour now...but I thought it was hilarious. Albuquerque is one of my favorite Al songs of all time...so that just made it even better. Overall...it was a great show. Best seats I've ever had for an Al concert (I've gotten front row many times, but it's never been that close in an indoor venue). I wish I would have had the foresight to try and sneak my camera in (using it would not have been a problem, since they didn't seem to care). Still..it was awesome, and if he ever plays there again, I'll definitely go back. My only gripe was that we didn't leave earlier yesterday. We were watching TV and by the time we got breakfast and got on the road, it was about noon. We ended up stuck at the Canada/US border for 3 hours, and then spent 3 more in traffic back to Seattle. Worst. Commute. Ever. Still a great weekend though! It was worth that horrible, horrible drive. Bring on the fair tomorrow!